Once again Chesil Beach has produced a cracking weekend of fishing for some. 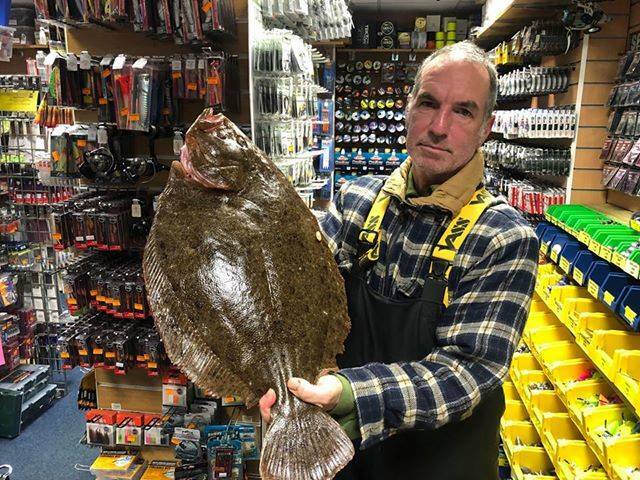 But it wasn’t the Cod that everyone has been seeking, it has been the flat fish that have hit the headlines, with a potential British record breaking Brill and some amazing Rays. Bernard Johnson weighed in a huge Brill of 8lb 3oz, which if verified, will break the record by over 1/2lb. I would call that a red letter day, but it would seem that Matty wanted more. The next day he decided to target Blonde Rays, in an attempt to catch a double figure one from the shore. He was pretty happy to achieve that with a fish of 16lb. Not bad, I say, but that was nothing! 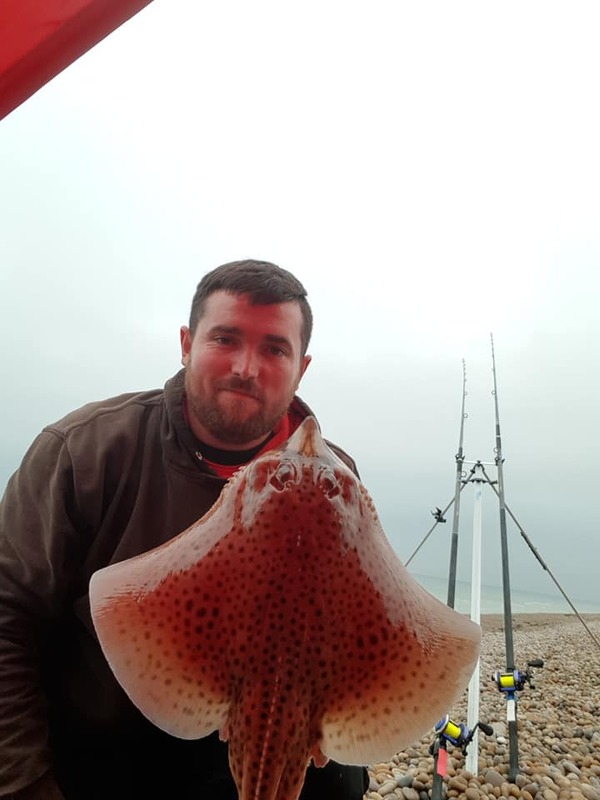 He managed to hook and land a massive Blonde Ray of 23lb 8oz, which was the highlight of the seven that he ended up with. It wasn’t just the beach that fished well. It was a good weekend for lure fishing, especially for Bass. I wouldn’t normally associate a small tide with good catches of Bass, but I know of several Bass over 6lb that were caught within Portland harbour on lures. Unfortunately as the mark was so recognisable, the angler didn’t want me to publish any of the pictures. Its so good, it can take two fish at once and if anyone is wondering if there are any Mackerel still around, I think this answers that question. Chesil Beach: 12.1°C, 1m swell Water is lightly coloured. Weymouth Bay: Surf up to 2m, with lightly coloured water. Chesil Beach forecast: The week will once again be dominated by easterly winds. The sea state is quite calm for most of the time, but there has been some huge rouge waves, that have created havoc over the weekend. Looking at news reports from the Atlantic, there appears to be some massive waves heading our way. They may never get here, but take extra care on the beach over the next few days. Set up, further up the beach than you would normally do. So what can we expect this week? The tides are building and the water will clear even more. I would expect even more rays and who knows, there is always the chance that we could see that 32lb Blonde Ray shore record tumble. The conditions are definitely going to be more suited to Whiting than Cod, but they can’t be ruled out. 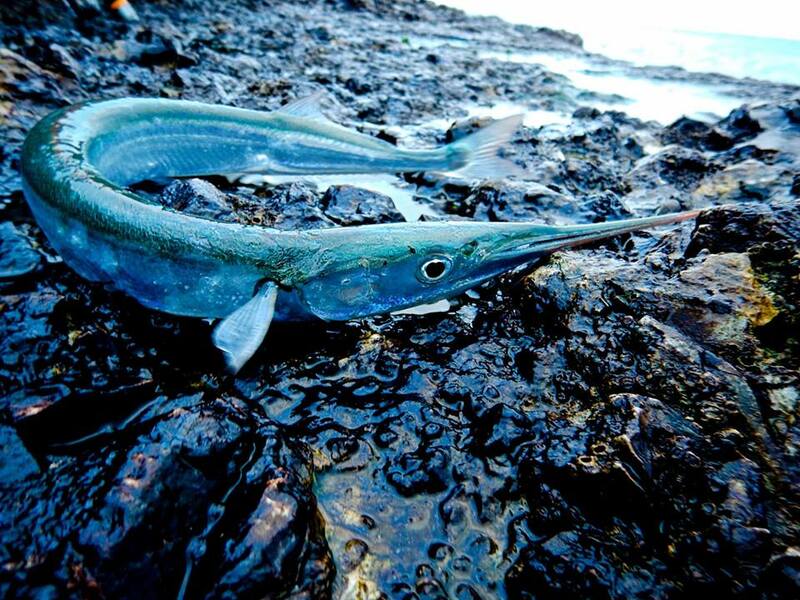 Dogfish and Pout, could well be a nuisance, but will keep the rod tips nodding. 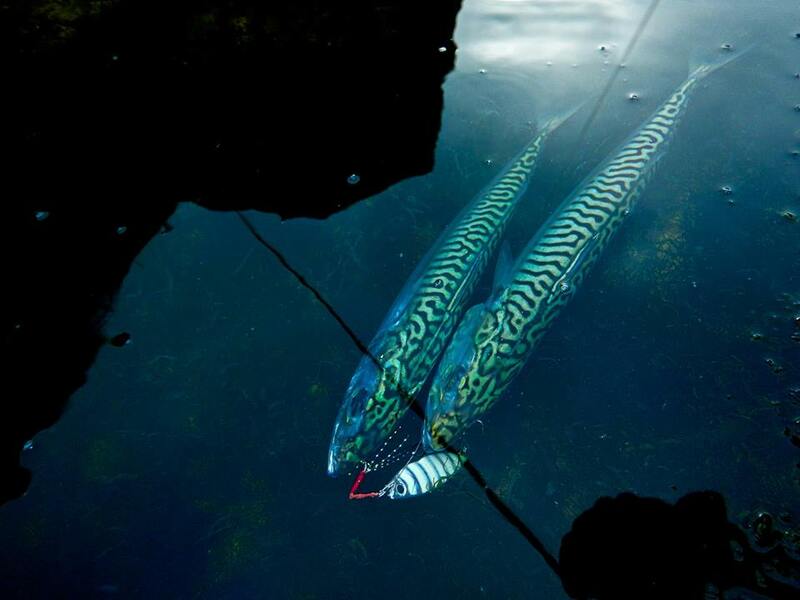 Daytime fishing will be good for Garfish and there are still Mackerel around. Portland Harbour: I will be hitting the harbour in search of a Bass or two on lures this week. 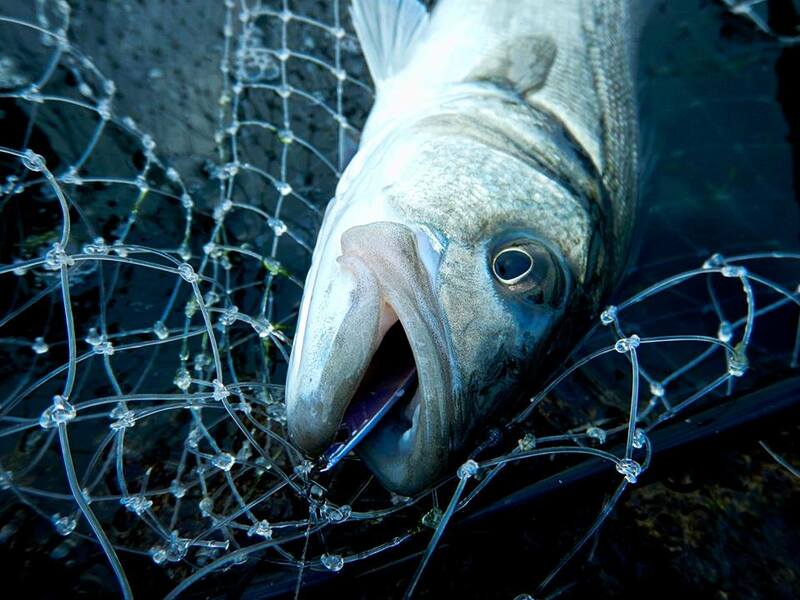 If you are more interested in using bait, then you could pick up a few Bass, Flounder and Wrasse. My top mark in the harbour would be Sandsfoot Castle area over low water. Portland: The island fished very well over the weekend for Garfish, Pollock, Mackerel and a few Bass. Expect the same and add Wrasse into the mix, as the wind drops. Personally, I would avoid the east side, as the wind will make it a bit uncomfortable. Weymouth Bay: Preston beach just screams Bass at the moment. If you are daring and careful, getting in the surf with a lure rod would be amazing fan and could produce some brilliant sport. For those that don’t fancy getting wet, then bait fishing will be productive as well. work and fish baits should work, but as the wind drops and the surf dies, the target will move from Bass to Flounder. I am hoping to find the time to target Squid towards that later part of the week. As the wind drops and the water clears, the squid fishing will improve. One Response to "Big Blondes and Record Breaking Brill"
Look forward to the review on that jig . Would be useful to have some tips on making assist hooks as they seem to be getting more popular but never easy to find in smaller sizes for shore fishing.